Page Impressions Ltd Blogcetera: The Kindle 2 – is it a sequel worth reading? This morning Amazon announced its second-generation ebook, the Kindle 2. The new Kindle 2 is lighter (well its 3 grams lighter! ), is a more contemporary design and it can now hold approximately 1,500 books. 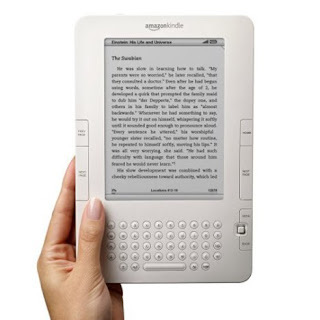 This is many times larger than the original 200 titles of the original Kindle and there are up to 230,000 titles to choose from the Amazon Kindle Shop. The most interesting development is the new Text to Speech feature which can read any book to you in one of three speech rates, and in either a male or female voice. Sadly the Kindle 2 is still only available in the US. Over here we just have the Sony Reader eBook which can have just 160 books and is exclusive to Waterstones or the iRex Iliad which at £449 is a great incentive to continue to buy the “real” thing. So when will we see the Kindle 2 in the UK? It is suggested that the problem lies with tying up deals with mobile operators or maybe it’s a problem of translating all those 230,000 titles from American into the Queen’s English. Whatever the reason, when it eventually arrives the ebook will become a definite “must have”. Interestingly, Google is also reported to be offering a browser tool running on Android, Google’s mobile OS, that allows you to read books via your Android enable mobile. It can’t be long before a Android enable ebook emerges, then the ebook market will be a little more dramatic.